I’ve been wanting to make some soft buns and I think I’ve finally found “the one”! Bread making requires a certain amount of patience but the end results are just so rewarding! And don’t you love being able to say that you make my own bread? There are many types of bread but my favourite are the ones sold in Chinese bakeries around here. Those are the kinds I grew up with eating! 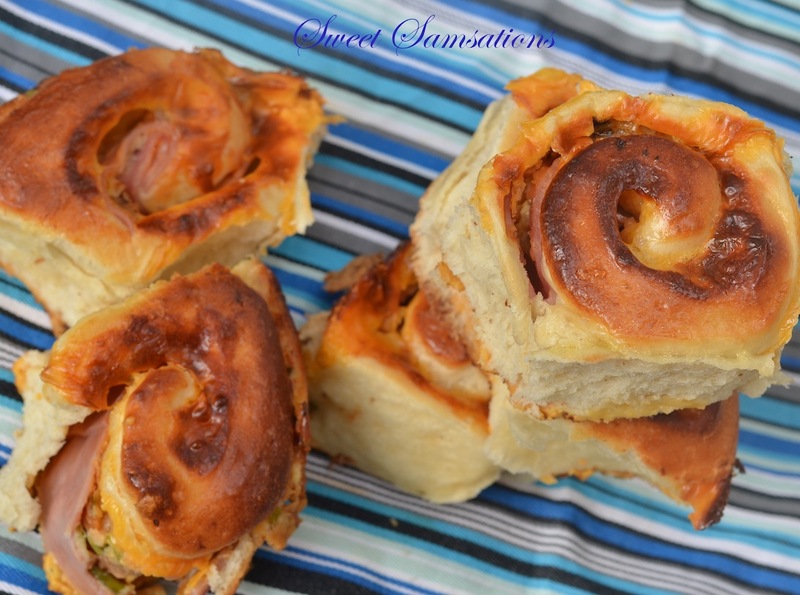 Soft, fluffy and sweet buns with either sweet and savoury fillings. mmmmm! 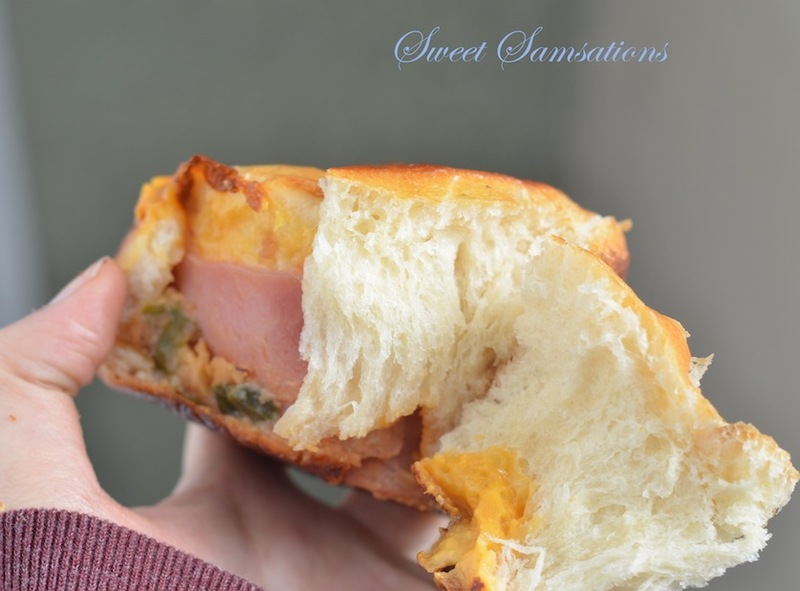 I’ve tried this sweet bun recipe thrice and so far it doesn’t disappoint! My bread always comes out soft and fluffy, even on the next day. 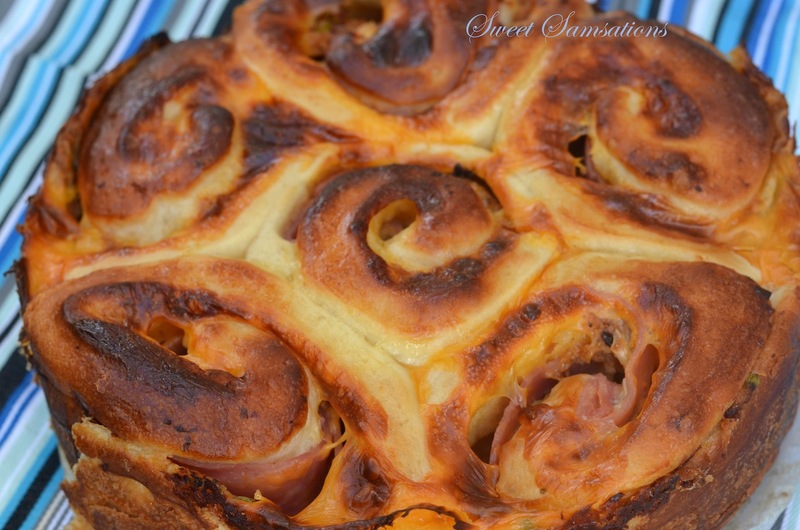 This was originally a cinnamon bun recipe but I was inspired by Twelve Loaves theme this month hosted by Lora of Cake Duchess, Jamie of Life’s a Feast and Barbara of Creative Culinary to create a CHEESY savoury roll instead! Without further ado, here’s my recipe! I increased the sugar to make it more like the sweet chinese buns in the bakery. Don’t worry, the sugar increase will only make it a little sweeter. In a small bowl, dissolve 1 teaspoon sugar and yeast in 1/4 cup milk. Let stand until creamy, about 10 minutes. Meanwhile, warm the other 1/4 cup milk in a small saucepan until it bubbles, then remove from heat. Mix in sugar, butter and salt; stir until melted. Let cool until lukewarm. In a large bowl, combine the yeast mixture, milk mixture, egg and 1/2 cup flour; stir well to combine. Stir in the remaining flour, 1/2 cup at a time, beating well after each addition. I used my stand mixer with the dough hook on the lowest speed to mix my dough. When the dough has pulled together, turn it out onto a lightly floured surface and knead until smooth and elastic, about 8 minutes. Lightly oil a large bowl, place the dough in the bowl and turn to coat with oil. Cover with a damp cloth and let rise in a warm place (approximately100F) until doubled in volume, about 1 hour. Turn dough out onto a lightly floured surface, roll into a 12×9 inch rectangle. For the filling, I layered it with 8 slices of ham, 8 cheddar cheese slices, mayo, green onions, another 8 slices of ham and shredded cheese. Starting at long side, tightly roll up, pinching seam to seal. With serrated knife, cut into 8 pieces; place cut side down, in prepared pan. Cover and let rise for 1 hour or until doubled in volume. Meanwhile, preheat oven to 350 degrees F.
Bake in preheated oven for about 20 minutes, until golden brown. And look how soft it is!!! Oh my gosh!! Time really flies doesn’t it? Can you believe that it’s almost OCTOBER ALREADY?! Whaaa? Where did 2012 go? And Happy Mooncake Festival to you guys!! I’ve had some decent mooncakes here but I really do miss the awesome variety of mooncakes that you can get in Asia! Oh my gosh that looks amazing! 😀 Definitely trying this sometime! What tasty looking savory rolls! Hey Sammi, looking gorgeous!!! Love those rolls that come with the ham & cheese (and sometimes sausage) at the bakeries. Definitely tasty looking stuff right there! Happy blasted moon festival too, 🙂 lots of feasting and merriment I hope! Oh yummy, these look so very good! 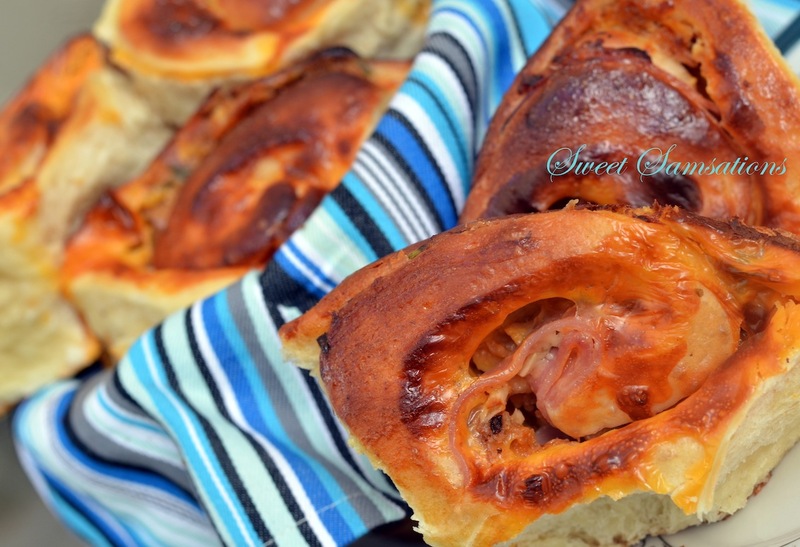 Oh I love stuffed breads 🙂 I think all breads should have filled with yummy things – great match of sweet and savory. They look so good. All stuffed with ham and the gooey cheese. Picture perfect and delicious. Agree, got to have those green scallions. Those rolls sure look fluffy. A little sugar in the dough sounds delish!!! 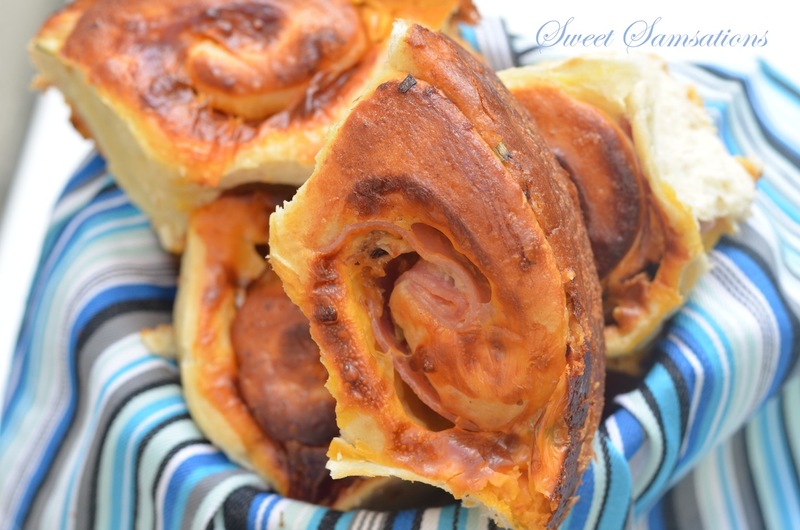 And I love that you rolled ham and cheese into these beauties…how wonderful! Oh wow, it’s like a full breakfast rolled into one lovely bread. Great for on-the-go purposes, too. Wow! Soft and delicious and full of cheesy goodness! I’ll take one (no two, no three!) Thank you for sharing such a yummy recipe. I can’t wait to give this a try! I love the idea of savory buns! They sound so delicious. I like change my italian flavors. This is my husband’s favorite bread when we go to Chinese bakery!! You made it from scratch… now that will make him very happy…. I have to conquer my fear for dough… I know everyone makes it so it shouldn’t be hard…but I’m always afraid it doesn’t rise nicely which happened to me! >_< Have a great weekend Sammie! Hey, Sammie! These look craaaaayzay good. I love sweet recipes turned savory. It’s fun. We used to go to these finger food buffets at church when I was little which was basically a bunch of cute little old ladies that made THE MOST AWESOME FOOD and punch as a fundraiser one evening a year… anyway, there were always these sorta sweet rolls stuffed with ham and cheese and they were my favorites!!! These look like those. Yummy. Also— I moved the hosting for Sugar Dish Me. The address is still the same http://www.sugardishme.com/ and it would be great if you still bounced over there from time to time! Love your recipes! Thanks! OMG, Sammie…a bakery bear me sells something similar to these, but they add corn to it. Yours look ten times better! I have to..MUST make these!!! Cheddar cheese is a relatively hard, pale yellow to off-white (unless artificially colored), and sometimes sharp-tasting, cheese. Originating in the English village of Cheddar in Somerset, cheeses of this style are produced beyond this region and in several countries around the world. .. Your recipe has 2 different kind of sugar. Please explain the different. Is white sugar just regular sugar?